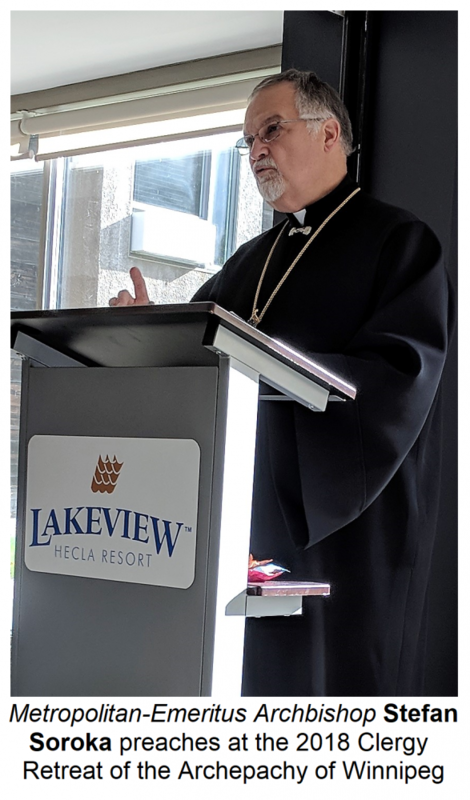 Metropolitan-emeritus of Philadelphia, Archbishop Stefan Soroka accepted the invitation to lead the 2018 Clergy Retreat of the Archeparchy of Winnipeg. Traditionally, all priests and deacons - both active and retired - that serve or reside within Manitoba are invited to participate. Due to reasons associated with health, finances or ministerial obligations, some are unable to participate every year. However, the vast majority are able to make the trip to the site of the retreat. This year, it is being held at the Lakeview Hecla Resort. Although it is primarily a hotel-type environment, Lakeview has allotted a dining hall and a conference wing to which the clergy practically has exclusive access. Archeparchial Syncellus Fr. Mark Gnutel, who has been responsible for organizing the retreat for a number of years now, prepared the area for the retreat. In fact, he transformed the designated prayer room into a Byzantine chapel very appropriate for the celebration of the Divine Liturgy and other prayer services - with an altar, iconostas, tetrapod, etc. 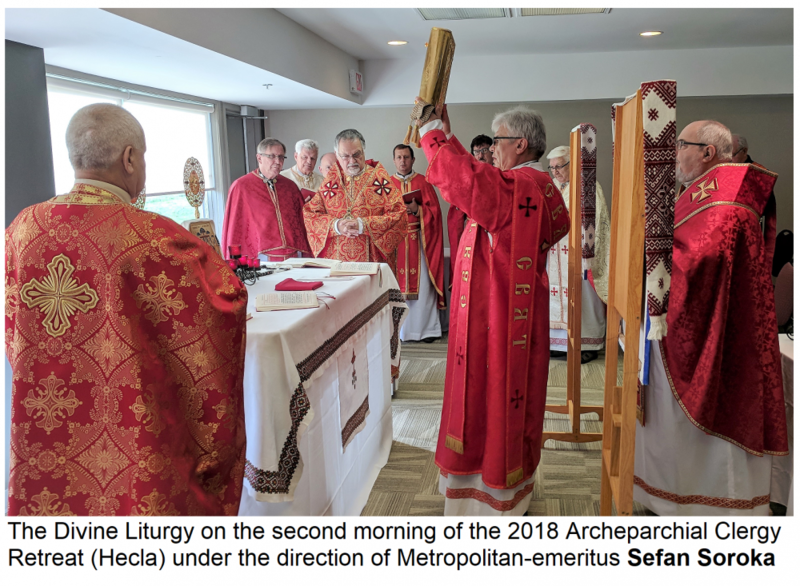 Although the Archbishop of Winnipeg, Metropolitan Lawrence Huculak is the main celebrant at the Eucharistic Liturgy, the other clergy take turns leading the various services of the Divine Office (vespers, Hours) and molebens etc. Throughout the 4-day retreat, that runs from September 18-21, Metropolitan Stefan will give 10 retreat talks or homilies on various themes. The clergy will return to their parishes by Sunday September 23. God willing, they will return spiritually refreshed and inspired to renew their ministry with and among the faithful entrusted to their pastoral care.